The Linksys WRE54G Wireless-G Range Expander can extend the coverage of your Wireless-G network. This article will guide you in setting up this particular device. • Wireless settings (wireless network name/SSID and wireless network password) - To learn how to get the wireless settings of your wireless router, click here. • IP Address of your wireless router - For instructions on checking the IP Address of your computer, click here. Access the range expander’s web-based set up page. For instructions, click here. If you’re using a Mac® computer, click here for instructions. Go to Setup > Basic Setup then click the Edit Security Settings button. 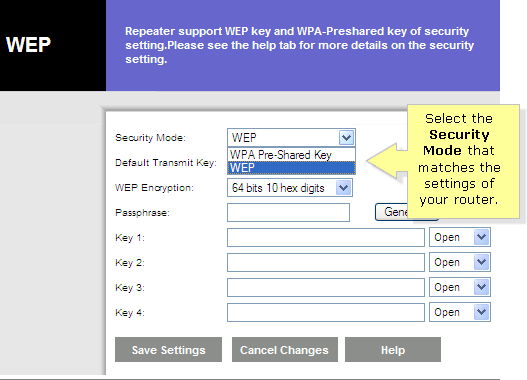 On the WEP page, click the drop-down arrow for Security Mode then select the one that corresponds to the security mode of your wireless router. NOTE: The Linksys WRE54G only has options for WEP and WPA™-Personal. It does not support WPA2™ security. Enter the security key that matches the settings of your wireless router then click Save Settings. You will be redirected back to the Setup tab. Change the Channel and the SSID to match the wireless settings of your wireless router. 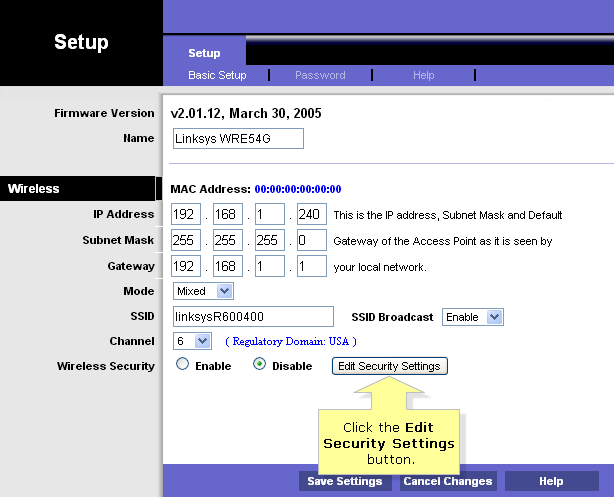 Enter the Gateway and the Subnet Mask values in the fields provided. Change the value of the first three (3) boxes of IP Address to match the settings of the router. Powercycle the range expander and check the lights. Two (2) blue lights indicate that the range expander has been configured properly. If the Link LED on the expander lights up red, it means that there is no connection established between the range expander and the router. For more information about this, click here.